Here in Franklin and in the surrounding counties, contentious issues are being debated, and the outcome of these debates will have a profound impact on the quality of life in our communities for decades to come. Whether or not to permit gas production by hydraulic fracturing in the Marcellus Shale is one of these issues. Another is the proposed construction of the Constitution Pipeline through the area. Both of these projects have sharply divided the region. Mirroring the polarized political climate of the nation as a whole, these debates are being driven by those with the strongest – and most divergent – opinions. As concerned citizens, many of us are opposed to hydrofracking in the region and do not believe that the proposed pipeline serves the interests of those who live on its path. There are strong arguments to buttress our positions and we feel it crucial to press the fight to persuade our fellow citizens. However, there are other citizens who believe that the potential economic benefits of these projects – to individuals, if not to the region as a whole – are powerful arguments in their favor. If we want to change the opinions of those who believe, rightly or wrongly, that their own economic wellbeing is aligned with either the pipeline or fracking, we need to understand their reasoning. 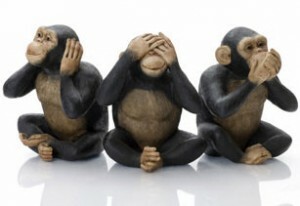 Everybody is familiar with the classic image of the three “wise” monkeys — see no evil, hear no evil, speak no evil. But living in the real world means seeing and hearing things we would perhaps prefer to ignore, and occasionally saying things that others may prefer not to hear. Not listening to those with whom we disagree will not keep them from spreading their message. More important, it leaves us without the tools to refute their arguments or persuade them to change. Persuasion is, after all, not something you do to people but something you do with them. It is a conversation, not a monologue. Arguments are not won by shutting down those with whom you disagree. They are won by changing minds. Social judgment theory is one way that social psychologists explain how this process of persuasion works. The theory asserts that opinions and attitudes are rarely changed dramatically or instantaneously. Instead, persuasion is an incremental process. So, for those of us who are trying to sway public opinion, what are the implications of this principle and how can we apply it to make our arguments resonate more strongly? Quite simply, if you advocate positions that fall into the latitudes of rejection of your intended audience, you are not going to be persuasive. And one way we can determine just where these latitudes might fall is to listen to their arguments. Our best chance of changing someone’s opinion, then, would be to advocate a position that falls within the latitude of non-commitment — even if it isn’t where you ultimately want them to end up. If you are coming from a position in the latitude of rejection, you won’t get too far, and might even cause them to cling to their anchor position more strongly. This means that persuasion takes place in a series of small movements. As we shift their anchor position ever so slightly, we are also shifting their latitudes of non-commitment and acceptance ever so slightly, which means that they will be a little more receptive to our next round of persuasion. The idea is to get people to open up to new ideas rather than cling to their preconceptions. It is much easier to get someone to agree with you if they have already agreed with you on another point, so you can develop a pattern of “yes” responses. In effect, they get into the habit of agreeing with you. In our case, we might need to find another issue – separate perhaps from the pipeline or fracking and within their latitudes of non-commitment– upon which we can find a point of agreement. Our best chance to find that space is to start hearing them out. Andy Bobrow is an assistant professor in the School of Media Studies at New School University and a lecturer at SUNY Oneonta. Almost six years ago, our state government made it practical for large drilling and fracking operations to begin in New York. None have, as of yet. Back in 2008, the Department of Environmental Conservation slipped through the legislature a seemingly inconsequential bill. It amended the list of spacing-units for oil and gas drilling in New York to include units for shales, thereby enabling drilling into shales without a hearing to set the individual unit size for each well. This bill was not on the DEC’s list of legislative goals for the year, and no hearings were held about it. Instead, the bill was introduced in the rush of legislation at the end of session, and passed both houses overwhelmingly. Some legislators said they voted for it assuming that since the bill was presented by the DEC, it was pro-environment. Afterwards, legislators heard from unhappy constituents. Before Governor Paterson could sign the bill, the Assembly liaison to DEC (Lupardo) scheduled public meetings on the topic. At the first meeting, in the town of Chenango, Broome County, the state was represented by Division of Mineral Resource’s regional supervisor (Collart) with other representatives from the Farm Bureau and Susquehanna River Basin Commission. Even before the standard Division slide show was over, the panel was bombarded by questions. They were unable to offer satisfactory answers. The next night in Greene, Chenango County, the panel was replaced by heavy hitters from Albany: the director of Bureau of Oil and Gas for DMR (Dahl), the deputy commissioner of DEC (Gruskin), and the chief environmental advisor to the Governor (Enck) — but with similar results. The uproar convinced Paterson that there were too many unknowns to permit this new form of drilling combined with high-volume hydraulic fracturing (HVHF). As a compromise, the Governor signed the bill but required that a Supplemental Generic Environmental Impact Statement would be written before drilling and fracking could begin. At the time (July 2008), the completion of this SGEIS was expected to take less than a year. Had the DEC waited to prepare even a minimal SGEIS before the spacings bill was passed, questions could have been answered and drilling could have begun following the signing. Instead, after more than half a decade, there is no certainty if or when the moratorium will be lifted. After a draft scoping document and public hearing, a first draft of the SGEIS itself was released in September of 2009, occasioning a barrage of criticism. Over 13,000 comments were submitted — far surpassing the 204 comments received by the 1988 draft GEIS, the first guide to environmentally safe drilling. The administration decided that a second draft was required. When Andrew Cuomo became governor in January of 2011, the revised draft was still not released – two years after the first draft and three after the start of the moratorium. While Cuomo signed an executive order to continue the moratorium on HVHF, he required the speedy completion of the SGEIS by July. Most of the revised draft was released by his deadline, but a cumulative impact appendix was not added until September of that year. Public comments were taken on the revised draft, both at hearings and in writing. The response was even greater. Over 60,000 comments were received, most of them critical of drilling. Apparently this made an impression, as did the frequent public protests. So time passed with no obvious progress. Because of a statutory deadline, in November of 2012 a series of regulations were proposed to implement some guidelines of the SGEIS, even before those guidelines had been finalized. But after much criticism and over 200,000 comments (mostly opposed), those proposed regulations were withdrawn. Repeatedly, the Governor has missed his own deadlines for deciding whether or not to allow HVHF in New York. For the last year or so, he has claimed to be waiting on a review by the state health commissioner Shah. His indecision may have more to do with public ambivalence about fracking. For years, Quinnipiac and Sienna opinion polls have been closely divided on the question of drilling, though recently there has been a slight plurality opposed. The prospects for drilling in New York are nowhere near as promising as in Pennsylvania. Yet pro-drilling groups have hyped the potential from the start, including leasing coalitions such as Joint Landowners Coalition NY, industry groups such as Independent Oil & Gas Association-NY, and government agencies such as the NYS Division of Mineral Resources. Although this agency has the primary responsibility for oversight of the oil and gas industry in New York, the DMR is essentially an industrial development agency, required by law to maximize production and minimize product left in the ground. While their hyping of the prospects built a groundswell of support for drilling, it has had the unintended consequence of building an even more vocal opposition. As a result, New York is the only state that has a moratorium in place while the environmental impacts of HVHF are being evaluated. Had it been public knowledge from the start that shale gas prospects are few in the Catskills and the Finger Lakes regions, there would likely be drilling right now along the border with Pennsylvania. Ironically, the pro-drilling faction bears much of the responsibility for the moratorium. Their earlier, short-sighted attempt to expedite horizontal drilling and HVHF by forgoing an SGEIS prior to enabling legislation led to the moratorium. Under Cuomo, their hyping the prospects of drilling rallied the opposition, encouraging the endless delaying of his decision, thus extending the moratorium. Otherwise, this sort of drilling might have begun in New York years ago. For fiscal year 2014/15, the state budget has no funds to begin regulating shale drilling, and the Commissioner of DEC has indicated that issuing the necessary permits is “highly unlikely” in the next fiscal year – in other words, not until after the next election for governor. But just last month, the Joint Landowners’ Coalition of New York and some land owners have petitioned the state under Article 78 of Civil Practice Law and Rules to (among other things) force release of the SGEIS and issuance of the Findings Statement – the final steps in the SGEIS process. Still, with appeals likely, the final judicial decision may come no sooner than the governor’s. Back in 2007, when The New Franklin Register started publishing, our focus was often on Peak Oil. As we sought to explain, Peak Oil refers to the moment when the amount of crude oil that can be extracted from the earth reaches its maximum and starts to decline. We also discussed the dire consequences likely to follow, since almost everything in modern industrial civilization depends upon a freely flowing supply of cheap and abundant oil. We now know that global production of conventional oil – the cheap and fairly accessible stuff most of us grew up with – peaked in 2005. The dire consequences first showed themselves to the average citizen in the prices of gasoline, diesel oil, and heating fuel. Back in 2005, gasoline cost about $1.88. You know what you pay now. But gasoline prices are only the most noticeable sign of crisis. Oil does much more than heat our homes and fuel our cars. It is the essential resource upon which all of industrial civilization depends. Up until the beginnings of agriculture, 10,000 or so years ago, our hunter-gatherer ancestors had only the sun for energy. As now, sunlight made plants grow, animals ate the plants, and humans ate both plants and animals, and burned fallen timber for fuel. There was neither need nor opportunity to use too much as there were not many humans and the population was kept in check by the availability of food. But when those ancestors settled down and became farmers, everything changed. Where farming succeeded, crop surpluses resulted. Crop surpluses led to growing populations, to cities and civilizations and the empires that arose wherever people needed or wanted to expand their influence and control. Empires grew until their populations exceeded the carrying capacity of the land and water that sustained them and then the empires collapsed. This happened to Babylon, to Rome, to the Mayans, and others. Humans are clever and thousands of years ago learned to smelt metals, giving us the Bronze Age and the Iron Age. Making steel for armor and weapons takes a lot of charcoal fuel and by the late 15th century, Europe found itself with rapidly declining forests and a population growing faster than the food supply. How convenient it was, then, that they found the Americas with their vast landmass, abundant forests and water, rich soils, and people with no immunity to European diseases. The highly developed trading networks of Central and South America had concentrated in the Inca, Aztec and Mayan cities great quantities of gold which the Spanish and Portuguese promptly stole. The English and French stole some from the Spanish, and the gold got to Europe where it funded what we call the Renaissance, banks, the rise of the Atlantic slave trade, and the great expansion of science and technology that led to the Industrial Revolution. When the Industrial Revolution really got going at the end of the 18th century, energy was needed and the English learned to mine coal from deep in the earth. The work of mining coal is very energy intensive: either you send men down the mine to toil with picks or, as now, you blast the tops off mountains and dig it out with great diesel-burning machines. So, when the first oil wells were drilled in Pennsylvania in 1859, having oil flow relatively easily from the earth seemed little short of miraculous. With cheap and abundant oil, the world changed. Ships and, later, airplanes could swiftly cross the oceans and move raw materials and manufactured goods to markets, and people to wherever they thought they could make a better life. Petroleum gave birth to chemical industries, industrialized food production, and a previously unimagined ease of living. But, alas, a century and a half of growing oil supplies and increasingly easy living has allowed us to forget thousands of years of struggle and hard work––and has encouraged some delusional thinking. For example: the fantastical notion that, on our finite Earth, we can keep growing our economy forever. Well, we can’t. A growing economy requires a growing energy supply and we can no longer grow our energy supply. At present, we are barely managing to keep our energy supplies at level, and that only by increasingly desperate measures, such as drilling five or more miles beneath the ocean, or destroying hundreds of square miles of Canada to cook tar out of sand, or by fracking. These methods of extracting fossil fuels are very expensive and use a lot of energy. And they penalize the future by leaving a toxic chemical mess that will harm future generations, poison the sea and air, and damage the systems that sustain life. Meanwhile, they deplete faster than the old free-flowing oil wells. The energy companies and some politicians understand the reality of declining energy supplies, but they seem intent on capturing the last nickels at the bottom of the oil barrel. In a town like Franklin, we still have a chance to preserve a healthy life on clean soil, drinking pure water, breathing clean air. But only if we work together to protect these precious resources and use them wisely. In early February, I had the good fortune to be part of a small group of people who observed a Golden Eagle up close. This juvenile female raptor, later named Maxine, was captured early one morning and “processed” for the next few hours as part of a research project. Processing entailed weighing, measuring and fitting her with a lightweight telemetry unit. The telemetry unit will upload data describing Maxine’s travels as she migrates to and from New York to her summer range in Canada. 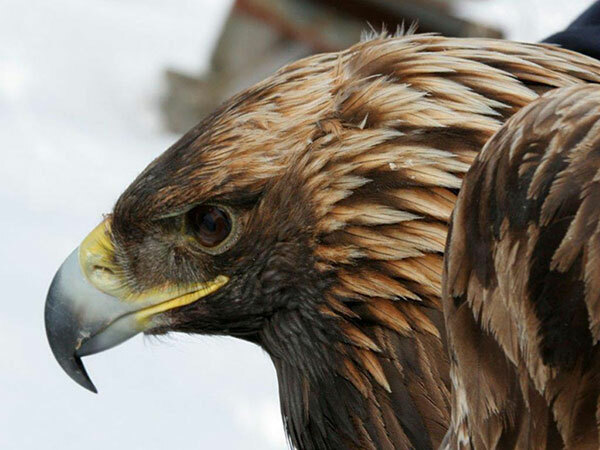 Information from her and other eagles will help researchers understand the migration patterns of Golden Eagles in the eastern United States. One reason for studying the migration and habits of Golden Eagles is the concern that they like to travel the same ridges which are ideal for siting wind turbines. When wind turbines are placed along these migration paths, the risk to eagles and other migratory birds of prey is great: collision mortality, habitat degradation, etc.. Data collected in recent years show a steady migration path between northeastern Canada and the southern Appalachians. Having reliable migration information will help researchers to work with developers and identify areas for wind energy which have minimal risk for migratory birds. More information on this fascinating research project can be viewed on the Delaware-Otsego Audubon Society website: doas.us. Helen McLean is the editor of The Belted Kingfisher, newsletter of the Delaware-Otsego Audubon Society. New York will never produce as much shale gas as Pennsylvania. 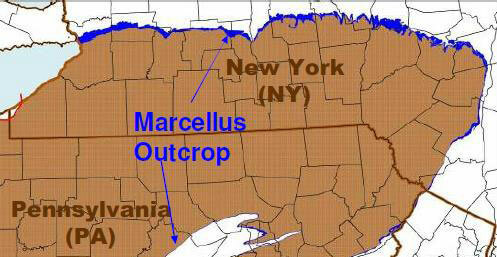 The four men – geologist and Franklin resident Brian Brock; James (Chip) Northrup; Thomas G. (Jerry) Acton; and Lou Allstadt – demolished the notion that the Marcellus or Utica shales beneath New York State can produce the large volume of natural gas which the DEC and fossil fuel companies claim exists. Dr. Anthony Ingraffea, a Cornell Professor of Engineering, moderated the evening, as he did last October for the panel in Ithaca. L to R, Lou Allstadt, Jerry Acton, Brian Brock and Chip Northrup. 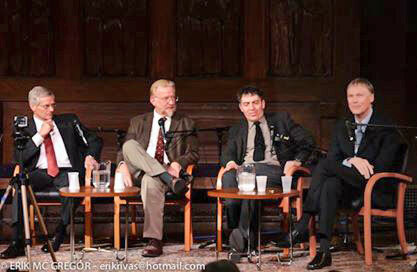 Photo, Courtesy New York Society for Ethical Culture. Many of us who live in the Southern Tier know the myths purveyed by fossil fuel companies eager to bring hydraulic fracturing to our neighborhoods. These myths promise local job creation and fat royalties in exchange for drilling rights and, of course, no spillage or contamination. But the biggest myth of all? An abundance of shale gas beneath New York’s rocky surface. The story begins with geology, Brock told the audience, around 150 people assembled in the Society’s domed, wood-paneled auditorium. Acton, a retired IBM and Lockheed Martin systems engineer, analyzed publicly available data from 1,795 productive Pennsylvania wells in 6 counties along the Northern Tier and 1,023 wells in southwest PA, all drilled from 2009 to 2013. Supporting the conventional wisdom of the industry, Acton’s maps, graphs and distilled data demonstrated that the most productive Pennsylvania wells occur where the Marcellus shale is thickest and deepest, largely at the intersection of Wyoming, Susquehanna and Bradford counties (the so-called “sweet spot”). To the north and west, where the shale formation becomes thinner and shallower – similar to New York’s – productivity drops off dramatically. In New York, shale deposits with the most potential exist only in a few spots along the Pennsylvania border, and those sites don’t promise enough shale gas to make drilling economically viable at today’s prices. Why, then, does the fossil fuel industry seem determined to hydrofrack in New York, if the geology and the economics are not on the industry’s side? Once upon at time, hyping New York’s potential productivity drew investor capital and upped the value of a company’s shares. Lately, according to Allstadt, a retired executive of Mobil Oil Corporation, many oil and gas companies, deterred by the prospect of expensive drilling and low return, have pulled out of New York State. But other firms, he cautioned, may be eager to frack on the cheap despite the poor economics. There are bigger threats, in Allstadt’s view: the lung-cancer-producing silica in the sand used during fracking; the methane emissions from pipeline leaks; radioactive material in the fluid that comes out along with the oil and gas; and the inadequate disposal of toxic fracking waste, which can drain into soil and water, endangering people upstate and down who eat local fish, meat and produce or drink water from the tap. “Fracking has an impact hundreds of miles beyond the wells,” said Allstadt. Take the chemical-laden fluid — euphemistically known as “brine” — that flows back to the surface after fracking. When not trucking it to Ohio for disposal, Pennsylvania uses it to de-ice roads during the winter. New York’s DEC says flowback water from hydrofracking is not being spread on the Empire State’s highways, but in 2013 the environmental group Riverkeeper (www.Riverkeeper.org) examined documents showing that for many years the DEC has given Beneficial Use Determinations, or BUDs, for brine from non-shale, vertical oil and gas wells. The lesson from Pennsylvania, the panelists concluded, is that hydrofracking in New York would be a low-reward, high-risk project. There is still much to fight for, they told the audience. The story isn’t over yet. Alexis Greene is an author and editor. She and her husband, Gordon Hough, work in NYC and live in a cabin outside of Walton. See the series of videos of the Manhattan talk below (click on Playlist to see others in the series), or go directly to YouTube. 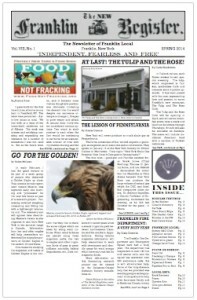 Download a PDF copy of the New Franklin Register Issue #22 (4.2MB) by clicking on the image. See the index of this issue, and links to all previous issues, on the index page.